We all know what it’s like to work in difficult financial times, and our fellow library staff are some of our best resources. We’re collaborating and sharing ideas to move PA forward. Need an idea? Search the database. Have a great idea? Share it with us. Your programs and services already promote PA Forward. Browse the Commons to make heads or tails of the literacies and see how your ideas can inspire libraries of all sizes and let others spark your own creativity. Libraries all across Pennsylvania are using PA Forward’s five literacies – Basic, Information, Civic and Social, Health, and Financial – as a guiding framework for setting service priorities, identifying potential community and funding partners, structuring strategic plans, and building well-rounded, multi-skilled boards. PA Forward doesn't make more work for libraries. It offers an effective way to position the literacy-focused programs, services, and information resources you already offer. There’s no need to create something new – although you might be inspired to emulate one of the great ideas you hear from other libraries. 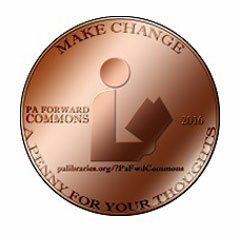 Search the PA Forward Commons by tag or do a keyword search using "PA Forward Commons" and your search terms. If you have a project that you would like to submit, please complete the PA Forward Commons Submission Form. Help others to plan, and PaLA will use your stories to help elected officials, community leaders, organizational partners, and the public understand the vital role libraries play in helping Pennsylvanians build their literacy skills. You do not need to be a Pennsylvania Library Association member to contribute to or use the Commons.